The shrub soon stopped growing, and began to get ready to produce a flower. 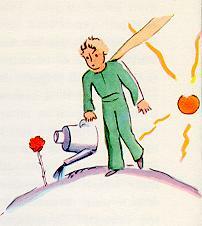 The little prince, who was present at the first appearance of a huge bud, felt at once that some sort of miraculous apparition must emerge from it. But the flower was not satisfied to complete the preparations for her beauty in the shelter of her green chamber. She chose her colors with the greatest care. She dressed herself slowly. She adjusted her petals one by one. She did not wish to go out into the world all rumpled, like the field poppies. It was only in the full radiance of her beauty that she wished to appear. Oh, yes! She was a coquettish creature! And her mysterious adornment lasted for days and days.